I’m a born and raised Mainer. I grew up using old and authentic rock walls as my balance beams, catching fireflies after dark in my back yard, and stuffing my cheeks full of as many blueberries as they could hold. While I have since moved myself to the sunshine and sandy beaches of the west coast, I am still a Mainer at heart…and I still love blueberries as much as I ever did. I tell you this because I want you to understand how delicious this jam is. I take blueberry everything very seriously and don’t waste my time on “meh” blueberry goods. Like those commercially prepared blueberry jams. Those are “meh” all the way. 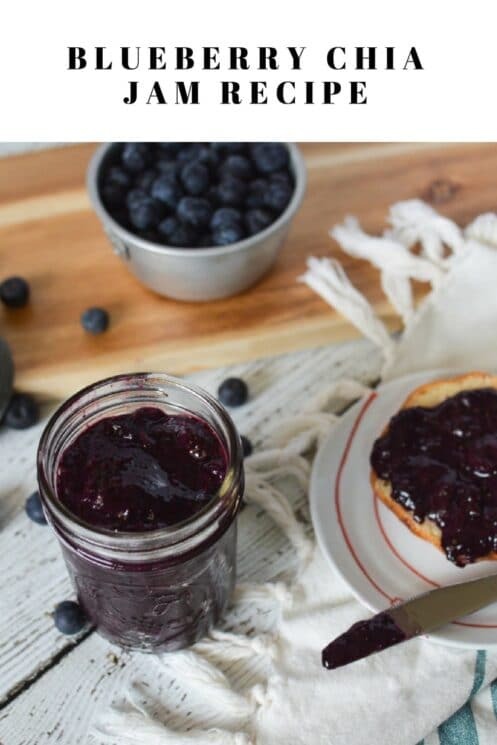 Loaded with sugar that covers up the natural sweet tartness of the blueberries, those jams almost make you feel like you are eating candy instead of a fruit product! I don’t give those jams the time of day. There is no need to when making your own homemade jam is easy as can be and has none of the added refined sugars or preservatives the store bought stuff contains. 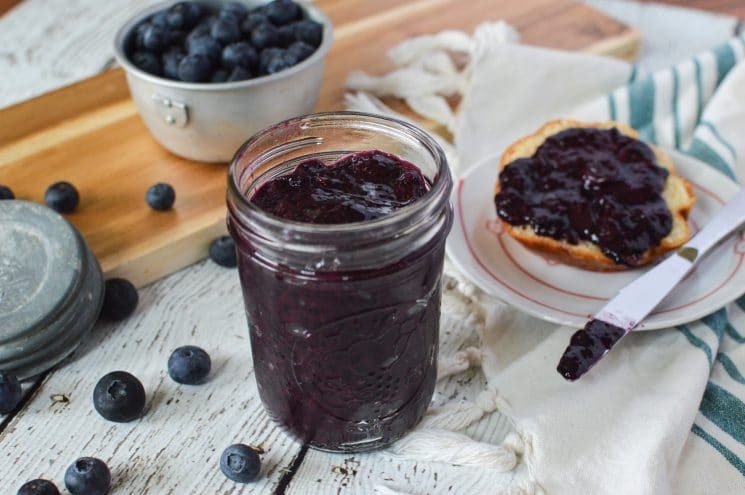 Delicious, homemade blueberry jam can be yours for the sandwich slathering in under 20 minutes. How, you ask? With the help of the magically oh-so-healthy chia seed. Chia seeds are these teeny tiny black (or sometimes white) seeds that are actually miniature super heroes. They are loaded with fiber, protein, calcium, and Omega-3s. Chia seeds take on the flavor of whatever they are added to. BONUS! They transform from dry little seeds into a clingy gelatin-like consistency when mixed with a liquid. With the assistance of these little chia seed pals of mine, making your own homemade jam is easy peasy! Plus, full of fruity goodness instead of the sugar and funky additives almost all store bought kinds have. Best of all, there is minimal cooking gear required, just a sauce pan and a potato masher or blender! 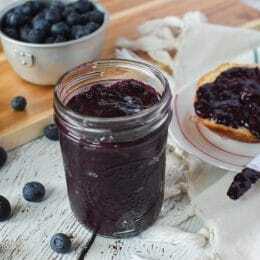 This blueberry chia jam is a lovely addition to a traditional peanut butter sandwich, but it is also delicious on toast, muffins, biscuits, oatmeal, overnight oats, and desserts. 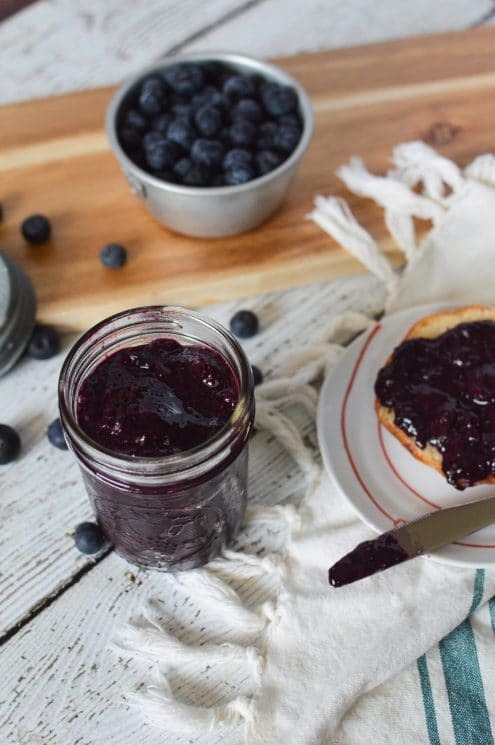 The magic and wonder of this simple jam is endless, so let’s get cooking. Once your jam is done and hanging out in your fridge, it should keep for up to two weeks. 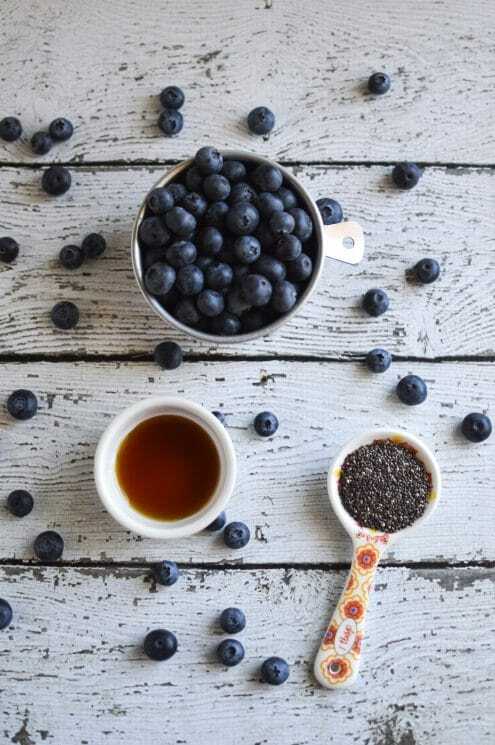 Blueberries are not the only fruit that can easily be transformed into delicious chia jam! Strawberries are also in season and strawberry chia jam is a great way to use up those berries that are just a little bit past their peak of freshness. In a medium sauce pan, combine the blueberries and maple syrup/honey. Bring to a boil over medium-low heat. Cover and cook until the blueberries start to pop (3-5 minutes). Stir occasionally. Using a potato masher, crush the berries to your desired texture. If you like a very smooth jam, you can use an immersion blender to puree the berries. Once the berries are mashed, use a whisk to stir in the chia seeds and turn the heat down to low. Stirring with whisk occasionally to prevent the chia seeds from clumping, cook for 10-13 minutes or until mixture starts to thicken. Allow jam to cool before transferring it to an air tight container. Store in fridge for up to two weeks. is this recipe good for canning? Do you think this jam could be canned? Or frozen? Can this jam be made with frozen fruit? I haven’t been able to find much in the way of organic where I live. We buy frozen organic fruit now.